Have you ever had Lobster Mac and Cheese? It is so amazing! You must try it! This Lobster Mac and Cheese Recipe takes only about 30 minutes to put together and then another 30 or so in the oven. This lobster mac and cheese recipe is very easy to make! If you have never made a bechamel, don’t be distressed. It is much easier than people suggest! 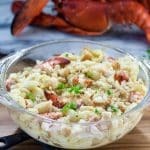 The reason this lobster mac and cheese recipe is so wonderful is that I use lobster stock in the bechamel, which gives it such a rich flavor! 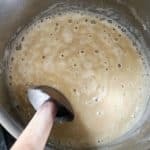 Have you ever made lobster, or even shrimp stock? It’s very easy to make. Just add the shells of the lobsters back to the water they were boiled in, crank the heat to high and cook it down until a quart or two remain. Let the stock cool and then strain it through cheese cloth to remove any solids or sand. You can do the same for any seafood, clams, shrimp, crab. It is great in soups, stews and this Mac and Cheese! If you add this stock to your cheese sauce, it amps up the flavors to all new heights! We are supposed to be eating more seafood. Right? Well pairing the lobster with mac and cheese means that it only cost me about $8.00 to add the meat from 1 small lobster. We have a fish monger nearby who sells culls (usually missing one claw) for $6.99 per pound, which is very cheap in this area. So this meal, although it looks extravagant, only cost about $14 dollars for 8 servings, or $1.75 per serving! What a decadent meal for so cheap! Do you love lobster? We love lobster! Check out my Lobster Pizza with Spinach and Gouda! You will love that, as well! Thanks for stopping by today! 1 lb small pasta, elbows, small shells, ziti, penne, etc. Cook lobster (place head first) in boiling water for about 7 minutes for first pound and the 3 minutes per additional pound. until dark red in color. Remove tail and claw meat from shell. Cut into bite sized pieces. Cook pasta according to package directions. Reserve a mug full of pasta water before draining pasta. 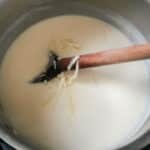 Heat milk in another pot on the stove or in the microwave until very warm. 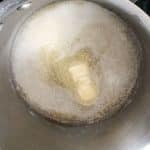 Add flour to melted butter. Whisk until smooth. Add warm milk all at once and whisk until smooth, stir constantly, until thick. Add cheese, reduce heat to low. Cook until sauce is very thick and cheese is melted. Add cheese sauce to pasta with enough cooking water to coat the pasta thoroughly. Mix in lobster. Add Macaroni and cheese to a 2 qt buttered casserole. Bake at 350°F for about 30 minutes, until hot and bubbly. Thanks, Sandi! I really appreciate that! Give it a try! You’ll love it!! You say “lobster”, I say “oh yeah”. You say “mac’n”cheese”, I say “oh yeah”. You took to it to the next level with this lobster mac-n-cheese so I am not sure what I say for that! But it looks delicious! Thanks so much, Helena! I appreciate that! Good gawd, we all need some of this right now! What a tempting bowl of yummy deliciousness with ALL of my favorite flavors. Pinning now! Haha! Thanks Traci!! I totally want to make more just looking at it!! IT is so amazingly good! Thanks Christina!! Haha, thank you so much Ramona! I totally want to make it again, too! I don’t know if my waistline will tolerate it though! A different combination..mac and cheese and lobster..unique..loved your presentation…. Thank you so much, Renu! I appreciate your comment!! The thought of lobster mac and cheese gives me palpitations, primarily because they are soooooo very expensive here. It does sound very delicious though! We are lucky that we have a local fishmonger who sells them cheap! Thanks, Brian!! I could eat lobster mac and cheese every few weeks. Yours looks so delicious and perfect! And that shot with the cheese string . . . Drool city!